“You are now vacillating,” she affirmed, looking directly at him. When he receives a strange task from a friend’s uncle, then, he decides to take it on, following an unknown man through the streets of Tokyo and observing his movements. However, this is all just a prelude to the main story. As the novel progresses, the focus shifts from Keitaro to his friend Sunaga, and to his extended family, including the uncle the youth was inadvertently shadowing. Becoming more intimate with them, Keitaro begins to learn more about their history and troubles, including unfortunate deaths and tangled love affairs. He soon realises that his own life is fairly mundane compared with that of Sunaga, whose placid exterior belies a troubled heart. 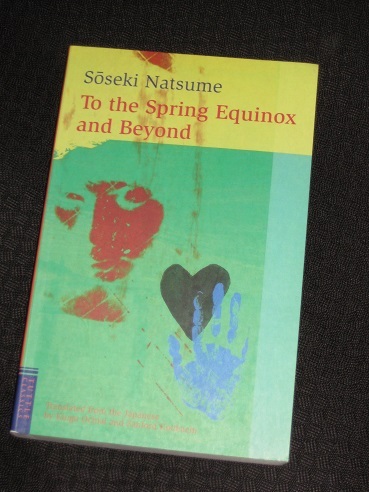 To the Spring Equinox and Beyond is said to be the first in a loose trilogy of works, connected by ideas, not characters, which continues with The Wayfarer and culminates in Kokoro. It certainly has much in common with the latter book, particularly in its use of stories within stories to reveal a doomed love affair. However, there’s a sense here that the structure isn’t quite as set from the start, with the initial focus on Keitaro eventually seeming overdone, given that for most of the book his role is simply that of a listener. This probably arose from the serialised nature of the work; with the novel published daily in the Asahi newspaper, there was every chance of the writer’s changing the emphasis of the story as he went along. The unusual title could suport this idea, having little to do with the story – the translators claim that it was simply a prediction as to how long the novel, starting with the new year, would go for! Nevertheless, the main story, when we get there, is excellent. Through Keitaro, we get to meet Sunaga’s slightly eccentric family, including his two uncles, Taguchi (a businessman with a penchant for practical jokes) and Matsumoto (an idler who shies away from the outside world). Sunaga himself is also an interesting character, a young man with a heavy heart. His gloomy demeanour comes from his firm belief that he is different from the other characters, a belief that is thrown into light late in the piece. Sunaga’s cousin, Chiyoko, is slowly introduced, and she eventually comes to stand at the heart of the novel. She first appears when Keitaro catches a glimpse of her entering Sunaga’s house, and we also see her during the young man’s (fake) mission, when she meets the man Keitaro is shadowing. By the time we are finally introduced to her formally at her father’s (Taguchi’s) house, we know that she is to be an important figure. She’s a fiery character, strong and alluring, and like Keitaro, we can’t help wondering what’s happening between her and Sunaga. This may all sound noble enough, but in true Sōseki style, these sentiments are intermingled with a healthy amount of cowardice, too. At some point, Sunaga will have to face up to this aspect of his character, and the consequences could be devastating. I can’t comment on many as I have limited works, however if I was asked I’d go “The Miner”. I’ll try & hunt down a copy of this one. Thanks for the review. Tony – Interesting, wouldn’t be one of my first choices! well, okay, if it’s for the fairies–amazon.co.jp seems to carry the book. There are second-hand copies floating around, but no new ones in the usual places (and Amazon.jp is *not* a usual place for me!). Very expensive in Indian stores, will wait for the prices to come down. Thanks for the intro. Emma – And there are plenty more out there, too!